Seasons are ready to roll out! After the end of the Beta Season, players will fight in Wars during two-month (60 days) Seasons in order to reach the highest possible amount of Trophies. At the end of each Season, players will get Season Rewards, based on their Team’s League. WARNING: In order to receive the Season Rewards, players must reach certain goals. During each Season, players need to participate (i.e. do at least one attack) in at least 10 Wars with the Team that they end the Season with. If players leave a team, the counter will be reset and they will need to participate in 10 more Wars with their new team. At the end of every Season, there will be a period of 3 days known as the “Off-Season” period. The Off-Season will be used to let all the Wars that started in the previous Season finish, so that the final score of the Season is correctly calculated. NOTE: During the Off-Season, teams won’t be able to earn Trophies when playing Team Wars, but they will still earn War Coins and War Medals. The current Beta Season is scheduled to finish on February 1st at 12pm CEST and the first War Season (Season 1) will begin on February 4th at 12pm CEST. At the end of the Beta Season, everyone will get Season Rewards. At the end of each Season, Teams that have more than 5500 Trophies will have their Trophies reset. The amount of Trophies above 5500 (up to 10000) will be reduced by 70%, which means that, for example, a Team that ends a Season with 8000 Trophies will be reset to 6250 Trophies on the next Season. NOTE: Teams that reach a Trophy amount higher than 10000 Trophies will be reset as if they had 10000 Trophies. This will allow us to condense the top of the ladder, but without equalizing the amount of Trophies of every team (which would result in very low-quality matches at the start of every Season). 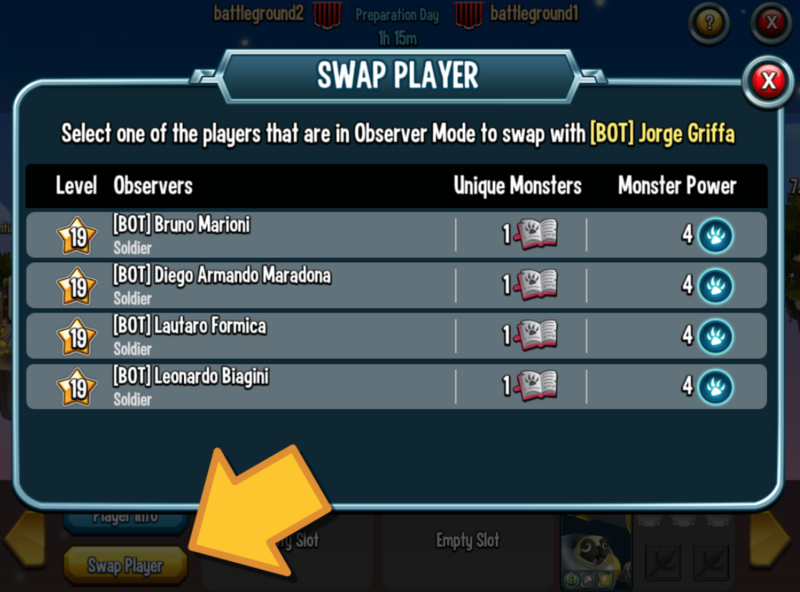 Team Leads will now be able to swap the players that are in Observer Mode, allowing them to join a War. Leads will also be able to put themselves in Observer Mode, if they choose to give their spot to another player. NOTE: Players that are on Observer Mode due to changing teams will not be able to be placed in a War until their cooldown period ends. We hope you enjoy these new additions to the Team Wars. We are constantly listening to your feedback and will keep working to improve the Team Wars experience.